Today, I am thrilled to share with you an interview with Natalie Replogle. She is the author of a fiction series called “Come to My Rescue.” If you haven’t read her books, I encourage you to check them out as soon as you’re done reading this post. Not only is Natalie an amazing author, she is a dear friend of mine. Before we became friends, I remember thinking to myself, “She is so cool. I need to be her friend.” Natalie loves Jesus and reflects Him in her life so well. She is also an incredible wife and Mom who loves her family deeply. Natalie is so much fun and brings joy to anyone she meets. Enjoy reading this post and getting to know Natalie more. My name is Natalie Replogle. I’ve been married to my husband, Gregory, for 14 years. We have three kids: Jarrett (12), Brayden (10) and Kyla (7). Besides being a full-time wife and mom, I am an author and also the Women’s Ministry Director at Grace Community Church. I enjoy reading, being with my family and friends, pretending that I’m a master gardener, taking walks, swimming, playing volleyball, and I’m also a Hallmark Movies & Mysteries channel fanatic. I began writing eight years ago. We were going through some very difficult times with our son Brayden having multiple health issues. We had also experienced two miscarriages months apart. At that time, I had no hobbies and honestly felt like I was drowning in grief, exhaustion, and life issues. I love to read and tell stories and had always had a dream of writing a book. So my husband encouraged me to let writing be my outlet and pursue the dream of writing. It took me almost a year to write my first manuscript and a year to find a publisher. The publisher encouraged a series. So with three kids and a schedule that felt like I ran it at breakneck speed, it took me nine months to write book two, six months to write book three, and a year to write book four. Personally, I enjoy reading Christian fiction and telling stories. I also enjoy taking readers through my characters’ journey of life and giving them a chance to connect with the characters and open their eyes to other people’s struggles. My desire is for women to see what a good, God-fearing relationship can look like. It’s not perfect because no one is, but it’s an example of two people pursuing Jesus together and all the grace, faults and forgiveness it holds. I believe that fiction can be a great tool to help people see how God can work in someone’s life. I’ve found many times when reading fiction the author has encouraged me to see God in a deeper way, and I want to do that for my readers. What is your desire for your fiction series? The fiction series is called, “Come To My Rescue.” In each of the books, the characters are faced with hard life issues that they need to be rescued from…and there is only one true rescuer, and that is Jesus Christ. My heart is so blessed when I hear from readers who share that God spoke to them in a specific way when reading one of my books. Many times I have had readers share that they connected to a certain storyline that they were also struggling with and it helped them to process more of their situation and what steps and healing needed to take place in their life. More than anything, my desire for this series is for my readers to grow closer to God. Yes, I hope to start up another series soon. This summer, my plan is to start my outline for what the next book and series will be. My dream would be to have another book available in fall of 2018! I hope you enjoyed learning a little more about Natalie Replogle today. Isn’t she amazing? Her books are too. I loved them all but my favorite was the last one. I am curious to hear which book is your favorite. Please comment below. Check out Natalie’s books on Amazon today! Fall of 2018 can’t come fast enough for me. 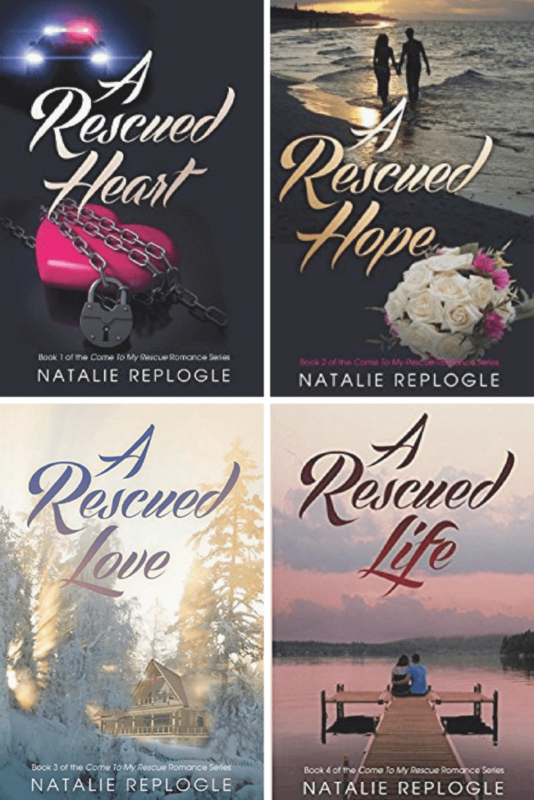 I am excited to read Natalie Replogle’s next series!